Back in June I published a post about why and how we cut our monthly expenses. Between then and now, I've received quite a few messages asking for details. At first I thought, "Didn't my blog post cover all of that?" I replied to messages as they came in. Eventually I read the original blog post over several times and realized I could have done better. I took a huge step outside of the box today. It wasn't planned. My plans were to conquer the usual work stuff, blogging, DIY Dog Mom Projects, new homemade dog treat recipes, housework, meal prep for the kids and humans, and catch up on some emails. Lisa was working later than usual. Our dinner menu of homemade chicken soup and pumpkin bread would accommodate her, "I'm not quite sure what time I'll be home." The Boys Have A New Routine. I'm Slightly Baffled. For the most part, our kids are on a routine. There's a Monday through Friday routine. There's a weekend routine. There's also a routine when Lisa has a 3 day weekend or takes a vacation day here and there. Our kids thrive on their routine. If I'm late giving them their afternoon snack, they let me know. If Lisa goes to bed after 9 p.m., they pace, get cranky, and make it obvious they're ready for bed. The story I'm about to share has nothing to do with our kids. That's okay. I like to keep Our Bodacious Dog Mom Life well rounded. Yes, we're Dog Moms, and our life revolves around our kids, however, at times, stuff happens, or we do something, and it doesn't involve the kids. Something like that happened earlier this evening. I took this photo about a year ago. It's a photo I refuse to delete from my photo folders. You're probably wondering, "What's so great about this photo?" 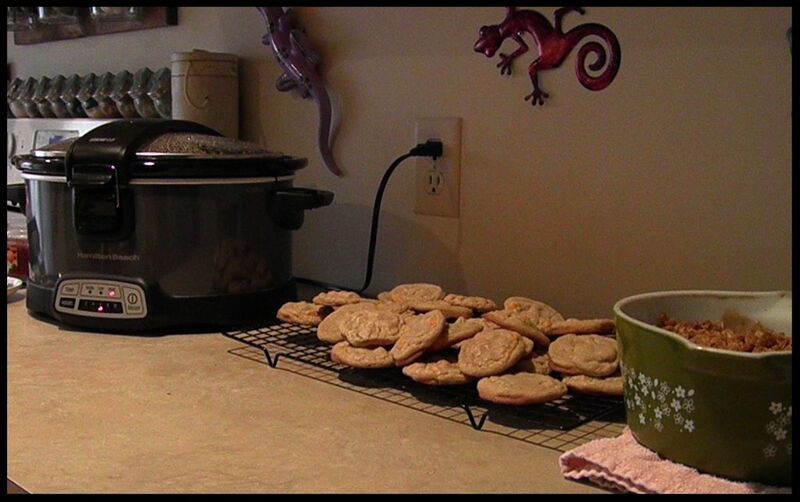 After all, it's just a photo of a crockpot, cookies, and something in a vintage casserole dish. Yes, that's true. It's definitely not a spectacular photo by any means. However, for me, this photo represents total Work-At-Home-Dog-Mom-Pride. Today Was The Day. I Crashed. The past few weeks have been extra crazy, busy. Lisa's been working late, I've been working on DIY projects, keeping up with the blogs and social media, getting our Bodacious Biscuit Love Bin ready, working out details for some changes on the Bodacious Biscuit Love end of things, etc. On top of that, I haven't been sleeping well and I'm surviving on about 2-3 hours of sleep a day. I usually do okay despite all, but this week has taken its toll. A few posts ago, I mentioned several of our neighbor friends had birthdays and an anniversary coming up all within the same week. In fact, 2 of those birthdays are on the same day. We absolutely love and adore these neighbor friends and wanted to do something special for each. With their dates of celebration so close, we decided to have a small party in the backyard with all of them present. We called it the Celebration of Life and Love. My homemade Pumpkin Bread isn't the only staple in our home during the Fall and Winter months. 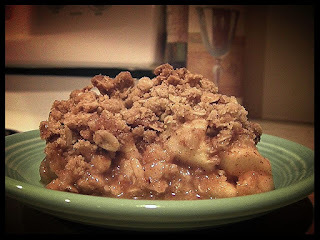 Another favorite is Apple Crisp. This time of year, the fruit bowl is filled with apples. I use these crisp gems to make baked goods. 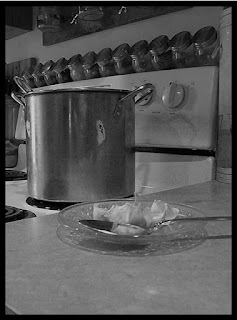 I also add diced apples to my harvest stew, chicken soup, and baked beans. After two days of painting and having to eat dinner in the living room, our Bodacious Biscuit Love Bin is done. Before heading to work this morning, Lisa put the hinges on for the cover. During the late morning hours, I put the second coat of paint on the wood dog bone sign (donated by the beautiful Lea Klock of New Hampshire) and, an hour later, painted the lettering. I used wood glue to secure the sign. Today, I Got High On Paint Fumes. Unintentionally, Of Course. On the overnight, I started the process of making our Bodacious Biscuit Love Bin. Or, as I nicknamed, The Big Blue Beast. I managed to give most of it 2 coats of paint. Two coats will do the trick. During this time, I had our jet stream going. This includes having a fan in the window, blowing out, in the kitchen, while the top portion of the window in the home office is opened. This was the scene moments ago. It's already bothering me. I work at home. I like a clean, organized environment at all times. Having a beast of a trunk on the table, and knowing it'll be there for a couple of days, will wreck havoc on my sense of balance. I can already feel it. It's brewing. However, it's all for a good cause. Inhale. Exhale slowly. The Kids Enjoyed A Rainy Day. So Did I. There's only a few days of the Summer season left. Today, for the first time all Summer, I wasn't able to open the curtains and rely on natural light. When I got up this morning, it was dark. I had to turn on lights throughout our home. That continued throughout the rest of the morning and afternoon hours. It rained all day. A good, hard rain. We needed it. Bad. There's about a half dozen blogs I have kept up with over the years. A few of them are Mommy bloggers. I appreciate their candid posts and uncensored tongues. That trumps their clique-y attitude and followers. They tend to have a narrow view of what the term Mom means. In other word, their attitude reflects the belief that you can only be a Mom if you have human kids. For that reason I don't participate in discussions and admire their posts from a distance. Earlier today, Lisa and I picked up a few things at the grocery store. We were waiting in line. The woman in front of us unloaded her groceries. The cashier greeted her and asked if she had any coupons. Without looking up from her phone, the woman in front of us said, "No." That was it. For the entire duration of the transaction, the woman didn't look up from her phone until it was time to whisk her cart away filled with bagged groceries. It's been almost 3 years since I've had my hair professionally cut or colored. The last time I visited a salon, it cost me over $100. I have long hair. To be expected. Between my crazy Dog Mom schedule and cringing at the thought of spending that kind of money on myself, I've gravitated towards DIY. When the length gets too long, Lisa gives it a good trim. When I'm in the mood to add splashes of color, I do it myself. Last year, at an event we participated in, Lisa bought raffle tickets. She put a few in the bucket to win a lilac bush. Lilacs are one of my favorite flowers. A few days after the event, Lisa got a phone call. Her ticket was chosen. She won the lilac bush. Two weeks later, we participated in another event put on by the same animal shelter organization. We brought the lilac bush home and Lisa planted it in the back yard. I tried to nap on the overnight, but couldn't. I needed to nap. The plumber was scheduled to arrive around 8:30 a.m. which meant I either needed to stay up, after Lisa left for work, or sleep for only 2 hours. I attempted to distract my brain with some of my favorite comedians, compliments of Netflix, who share the same warped sense of humor as myself. Louis C.K. John Mulaney. Chelsea Handler. Jim Gaffigan. I sipped diet Pepsi and crunched on ice to muffle my giggles. I Made Christmas Ornaments On A Gorgeous Summer Day! It happened today. For the first time in over a decade, I made a batch of salt dough and baked some ornaments. After almost 3 years of working with dog biscuit dough, it was weird rolling and cutting bone shaped dough ornaments. The salt dough is completely different and and extremely temperamental. It's not as forgiving as my biscuit dough. After many, many years, I've broken my golden rule of not making anything pumpkin or indulging in anything pumpkin spiced until the first official day of fall. I've already sipped pumpkin spiced iced coffee and yesterday, I made several loaves of pumpkin bread. And, when shopping for supplies to make DIY doggy Christmas ornaments, I bought pumpkin spiced and apple cinnamon wax tarts. 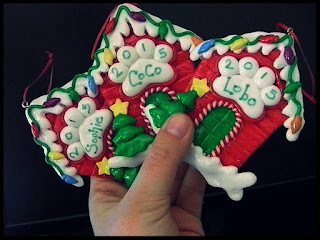 This coming week I'm going to dust off my creative salt dough ornament cap and whip up some Christmas ornaments. In order to do that, I needed to purchase a few supplies. My go-to place for craft stuff is Michael's, but I only shop at this location when there's a sale or coupons. Today, there was both. I picked up a great set of paintbrushes, a big bottle of triple thick glaze, and 6 bottles of paint. Between lowest-prices-of-the-season sale items and using a 50% off 1 regular priced item coupon, we paid $11 and some change for everything. I was a happy girl. Earlier this evening, after we ate dinner and cleaned up, I was sitting on the home office love seat. It was quiet. I had shut the air conditioner off in the living room. Lobo was on my lap. Coco was curled up beside of me. Sophie was on the new DIY doggy bed Lisa and I made last weekend. Like myself, she appeared to be deep in thought. On the way home from work, Lisa made 2 stops. The first was to pick up a few things at the grocery store. The second stop was Dunkin' Donuts. At the grocery store, Lisa spotted a pack of colored crazy straws. I sip most of my beverages through straws. Yes, sometimes, even coffee. Hot or iced. Today, it was iced coffee. Pumpkin Spiced iced coffee. Have I Mentioned How Much I Hate Ticks? After 4 days of fatigue, flu like symptoms, and a headache, I put my foot down and demanded she make an emergency appointment with her doctor. On September 1st, Lisa was put on a regimen of medications to treat Lyme. During her long Labor Day weekend, I cancelled plans and, again, put my foot down. Rest. Lots of it. Although she felt a little better yesterday, she still had the headache. She went to her follow up appointment yesterday after work. The tests came back positive for Lyme Disease. Every year we purchase Christmas ornaments for the kids. The places where we purchase these ornaments have varied. One year we stumbled on a quaint little country store that offered Christmas ornaments. Another year we purchased the ornaments at a holiday kiosk at a nearby mall. The past couple of years, we picked through the meager selection at Michael's. Last year, the selection sucked. I remember telling Lisa, "This is the last year we're buying their ornaments. Starting next year, I'm making 'em." Late last week, Hurricane Hermine ripped through a portion of Florida and moved up the east coast. I made sure to keep updated on the projected path and if and when it would hit us. It simmered down to a Tropical Storm and than a post-tropical storm. Regardless of what type of storm Hermine had turned into, there would be coastal flooding and strong winds. After the power issues we experienced the week Lisa was on vacation, during the massive, record breaking heatwave and storms, I wasn't taking any chances. Our DIY Doggy Bed Is Done. Proud Moment. I don't normally post the "after" photo first, but today I'm making an exception. The DIY doggy platform bed is done! This is the DIY bed I envisioned in my head, we purchased supplies for and wanted to make around the 4th of July weekend. That didn't exactly happen. Life got busy. I took on a temporary, month-long freelance project that sucked up a lot of my time. In addition, we've been making changes on the Bodacious Biscuit Love end of things and we decided to enjoy the summer season a bit. It Was A Quiet Saturday. Much Needed. After an emergency visit to her doctor on Thursday, Lisa started a regimen of medications for Lyme. She's had a persistent headache, flu like symptoms, achy muscles, and extreme fatigue. I cancelled what few plans we had over the long Labor Day weekend. At first, she resisted, but I stood firm. We're both stubborn. It was quite the showdown of stubbornness. However, an hour after Lisa got up this morning, she had no leg to stand on. Lisa fell asleep on the living room chair. This was after she said, "I'm fine. You don't need to take care of me" Ah. Huh. Housework. Quesadillas. Finishing Up The DIY Doggy Platform Bed. Lisa went to bed early this evening. She is sleeping soundly with the kids. Her headache, from the Lyme she was diagnosed with yesterday, has eased a bit, but she still has the chronic fatigue and flu like symptoms. 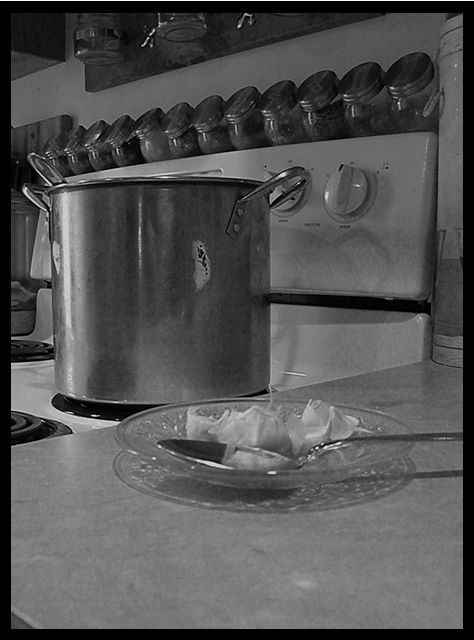 I got up a little early this morning, completed mass amounts of housework so Lisa wouldn't have to worry about a thing over the weekend, and prepped dinner for this evening. I had everything done by the time she arrived home from work. Happy September 1st. Lisa Has Lyme. On Monday, Lisa woke up with a headache. She took Ibuprofen. By Tuesday, the headache was still there. It was accompanied with extreme fatigue and flu like symptoms. She took Dayquil. Wrote it off as sinus issues. On Wednesday, she started taking an antibiotic that was leftover from her ear infection earlier this year. More Ibuprofen. When she arrived home from work a little early, she napped for a couple of hours.